Fluid-Applied Roofing Systems — Coatings Application & Waterproofing Co.
NEOGARD® Direct Bond Roof Coating Systems - Proven cost effective roof coating solutions. Seamless roof coating systems when properly prepared, installed and maintained will stop leaks, while bridging specified seams and cracks. Proven performance in all climates from salt-water regions to upper mountain snow, to rain forests and deserts. ENERGY STAR qualified roof products reflect more of the sun's rays. This can lower roof surface temperature by up to 100° F, decreasing the amount of heat transferred into a building. FLEXIBILE: Elasta-Gard® roof coating systems resist damage from thermal movement, impact and standing water. DURABLE: Sustainable membrane requires little maintenance, with periodic re-coating to extend the life of the coating. COST EFFECTIVE: Energy saving plus reduced disruption for tear-off and disposal can be dramatic. LIGHTWEIGHT: Compared to traditional roof protections our coating can reduce overall weight and allow for multiple re-coats with less structural stress. By isolating the roof from the elements, the fully-adhered system provides long-term waterproof protection with minimal maintenance, replacement and disposal costs. Elasta-Gard extends the life of existing built-up and modified bitumen roofs. The seamless protective barrier prevents moisture intrusion and bridges troublesome cracks for new and existing concrete roof decks. 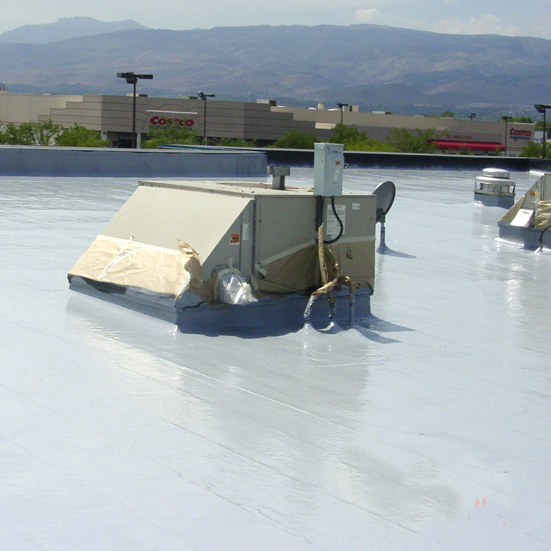 The high-performance coating bonds directly to the membrane, forming a durable layer of defense against moisture, ultraviolet light, impact, traffic, chemicals and standing water to extend the life of the roof. When properly prepared and installed these high-performance coating systems bond directly to most substrates forming a durable defense against moisture, ultraviolet light and standing water. In properly specified conditions these Direct Bond systems provide an extremely economical coating solution.